Secretary of the Navy John Dalton announced today his decision to name the lead ship of the New Attack Submarine class the USS Virginia (SSN 774). "I can think of no other state that so embodies the maritime heritage of this great Nation than the Commonwealth of Virginia," said Secretary Dalton. "I am also most grateful to the Virginia delegation for their strong support of the Navy Department. The submarines of the Virginia class will silently roam the world's oceans for decades to come, carrying the spirit of America and Virginia with them wherever they go." The Navy's next-generation attack submarine, the Virginia class, will provide the U.S. Navy with the capabilities it requires to maintain the nation's undersea supremacy well into the 21st century. Virginia will have improved stealthiness, sophisticated surveillance capabilities and Special Warfare enhancements which will enable it to meet the Navy's multimission requirements. Sen. John Warner commented: "For the past several years, the Senate Armed Services Committee has taken the lead in Congress to obtain the authorization for this new class of submarine, whose mission will be to deter aggression and preserve freedom. Generations of Virginians, beginning in the early 1600s, have likewise been in the forefront for the cause of freedom. So our state with pride and humility accepts the Navy's decision to have these ships bear the name Virginia." "I'm pleased that the U.S. Navy has honored the Commonwealth by bestowing the name Virginia on the New Attack Submarine class," Sen. Chuck Robb said. "As the seventh ship of the U.S. Navy to carry the name Virginia, this new submarine continues the tradition, started by the original USS Virginia in 1777, of recognizing Virginia's indispensable role in defending our nation's freedom." Virginia will be able to attack targets ashore with highly accurate Tomahawk cruise missiles and conduct covert long-term surveillance of land areas, littoral waters or other sea forces. Other missions Virginia will conduct include anti-submarine and anti-ship warfare, special forces delivery and support, and mine delivery and minefield mapping. With enhanced communications connectivity, Virginia also will provide important battle group and joint task force support, with full integration into carrier battle group operations. The Virginia class of attack submarines surpasses the performance of any current projected threat submarine, ensuring U.S. undersea dominance well into the next century. 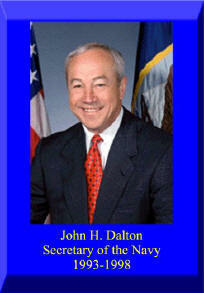 Webmaster Note: The 70th Navy Secretary graduated from the U.S. Naval Academy in 1964 and served aboard two submarines before leaving active duty in 1969. Kenn served with Secretary Dalton aboard the USS JOHN C. CALHOUN (SSBN-630) (Gold) where he performed duties as main propulsion assistant, communications officer and weapons officer. Kenn performed duties as a Radioman aboard Calhoun for three patrols, Leading Radioman for four patrols, and the Qualification Chief Petty Officer for one year.